One of my family’s favorite Thanksgiving accompaniments is bread…of any type. Biscuits, rolls, an Italian or French loaf…which got me thinking. How could I switch it up a bit in a healthy, yummy way that is worthy of a special occasion? Popovers! If you’ve never had a popover…sad to be you! They are a wonderfully eggy, crisp on the outside, light-as-air and rich on the inside roll (of sorts) that is super easy to make and, as it turns out, pretty easy to make healthier! Most popover recipes call for several eggs, melted butter, milk, white flour, salt…and that’s about it. I stayed pretty true to the spirit of the popover, using eggs (I reduced the number of whole eggs to 1 and used a few egg whites in the place of remaining whole eggs (most recipes call for at least 3 eggs)). I even included a couple of tablespoons of light butter (it is Thanksgiving for goodness sake!). I used skim milk and mostly whole wheat flour to round out the Recipe Redux-worthy version of this amazing roll. 9. Remove from the oven and, using a small sharp knife or a skewer, poke a small hole in the top of each popover to allow steam to escape, keeping the popover from becoming soggy). Serve immediately! 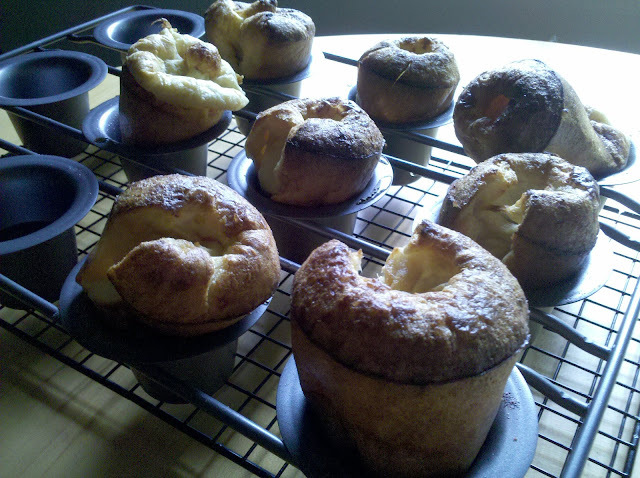 I love popovers but rarely make them – am intrigued by your whole grain version! Welcome to ReDux! I love popovers and have a new popover pan that I’ve been itching to use. This recipe is a keeper. Now all I need is a working oven! I love popovers and these look fabulous! Have to try them! Love the idea of lighter whole grain popovers! Have a wonderful Thanksgiving. I don’t have a popover pan, but do have a large muffin pan. I love popovers, but I don’t ever make them. Love the fact you’ve made them healthier.